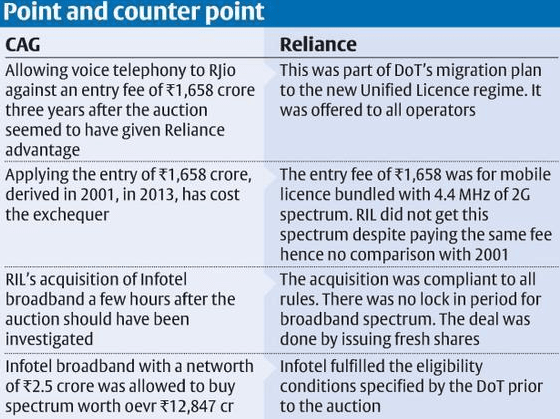 Comptroller & Auditor General of India in a draft report sent to the Department of Telecom for comments, said, “the DoT failed to recognise the tell-tale sign of rigging of the auction right from beginning of the auction” in which a small ISP, Infotel Broadband Services Pvt Ltd (IBSPL) emerged winner of pan-India broadband spectrum by paying 5,000 times of its net worth. CAG says IBSPL, ranked 150th in the list of ISPs, submitted an earnest money deposit of Rs 252.50 crore through the covert and overt assistance of third party / private bank, bid for Rs 12,847.77 crore (5000 times of its net worth) for pan-India spectrum and then sold the company on the day of completion of the auction. This indicated IBSPL’s collusion and sharing of the confidential information with a third party in violation of auction conditions, said CAG. RIL spokesperson said that as per NIA bidders were required to submit Bank Guarantee for desired amount as Earnest Money Deposit (EMD) along with its application. “EMD was based on specific deposit requirement for each telecom circle. Accordingly Infotel Broadband Services Pvt Ltd (IBSPL) submitted a Bank Guarantee of Rs 253 crore in format as prescribed in NIA. Since no money was deposited as EMD, the question of source of deposit does not arise,” RIL spokesperson said reports Outlook India . According to CAG, due to inclusion of inadequate eligibility criterion for participation in the auction, the promoters of the IBSPL enriched themselves and made unfair gain. CAG rejected DoT response that the eligibility criterion for participation in the auction was finalized after due diligence and on sector regulator TRAI’s recommendations saying it was department’s responsibility to ensure that only serious ISPs participated in the auction. DoT in its response admitted that there was no eligibility criterion with respect to minimum net worth or paid up capital for participation in the auction. The inter-ministerial committee did not satisfy itself as to how the IBSPL, a company with a net worth of Rs 2.5 crore, would be able to pay the bid amount of Rs 12,847.77 crore within ten days. Business line sent a questionnaire to Reliance Jio asking its views on the allegations made by CAG on its backdoor entry into voice services and rigging the BWA auctions in 2010. The response given by Rjio to CAG’s allegations has been presented in a tabulated form below. Reliance Jio is enteriung the Himalayan State of Sikkim and they plan to have 18 towers put up in Gangtok, the capital. Where can you find the CAG report online? Does anyone have it? If so, kindly share the report or the link.